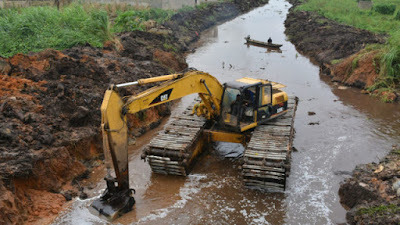 In order to allay the fear of flooding in the state, the Lagos State Public Works Corporation (LSPWC) has embarked on inspection of ongoing maintenance work at various drainage sites. Speaking at Egbe-Idimu – Isheri-Oshun drainage channel, Director Drainage Services, Abiodun Dankuwo, representing the Special Adviser to the Governor on Public Works and Drainages, said the state government had put in place control measures that will checkmate flood that may arise as a result of torrential rainfall. He said: “The Egbe Idimu drainage channel is a very long drain which cuts across many communities. The drain is being dredged to de-flood catchment areas. The channel leads to Festac Canal and as it is being dredged, it allows easy flow into smaller drains. Other areas visited include Pako Aguda Drainage Channel in Surulere and Akin Olugbade collector drain at Victoria Island. The Director reiterated that similar work is being replicated at other drainage channels across the state and that it is an all year round exercise.